Taiwan to Egypt: The long route! Life, work, travel plans - The countdown to a better life! View The Big Trip on lucid's travel map. 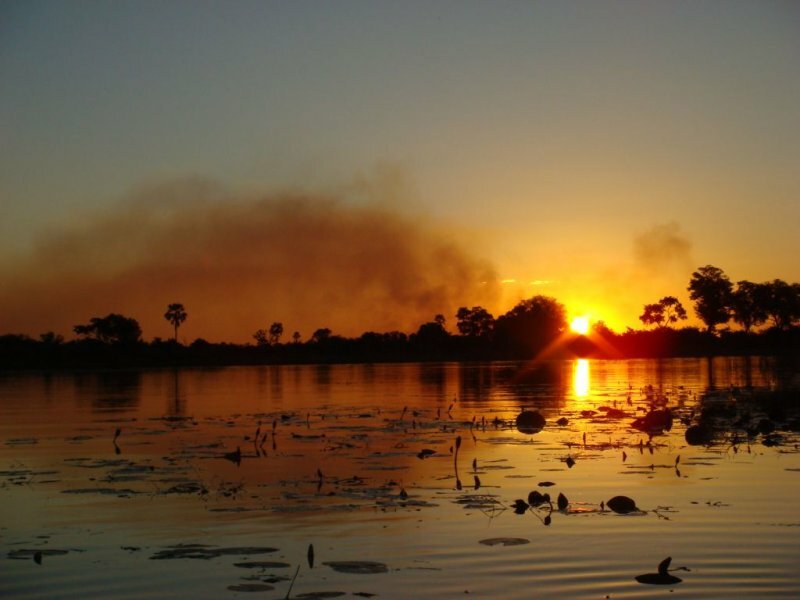 After wandering like 'real' travelers through Thailand and Cambodia it was fantastic to know that the next 7 weeks would be guided and we would no longer have to worry about how to get everywhere and how much to pay to see what was worth seeing. This trip was all encompassing, intense (in terms of the amount of time we spent on the road) and extremely enjoyable. Of course there were times along the way where things ground us down, like the 4am wake up calls, 15 hours driving, people we were forced to be around but didn't like and other little issues but none of it really mattered once we arrived at each beautiful destination and went looking for animals, camped in the middle of game parks, looked out across many amazing sunsets and settled down in our little circle to eat at night. It was like having the best holiday ever, again and again as we entered each new country. We flew into Nairobi, and spent a day recovering in the hotel from jet lag. It was a 9 hour flight from Thailand and had lost about 5 hours through time zone changes. We didn't venture out of the hotel since Nairobi had been described as a particularly dangerous place and we didn't want to take the risk of being mugged before the trip had even begun. We set out early for our 3 days Masai Mara trip in a minivan with 4 other people, 2 of which were going to be joining us on the main trip. We were glad to get out of the city, which is incredibly polluted (which says a lot since we had come from 2 very polluted Asian cities just recently). Even with a folded bandana over your mouth and nose it is possible to smell the exhaust fumes. The first period of excitement came at a police checkpoint somewhere outside of Nairobi. Our driver was pulled over and we were threatened that if we did not put our seat belts on we would be taken to court. A simple enough request you would think but finding a working seat belt in the minivan was easier said than done. Luckily there were only 6 of us in the 10 seater van because there were only 6 usable seat belts. As we were waiting to be moved on a truck passed us, oblivious to the stinger across the road (which marked the checkpoint) and promptly ran straight into it. The policeman started shouting at the truck driver and eventually got him to reverse and pull onto the side of the road (along with a number of other cars and trucks). The obviously drunk policeman signaled to our driver to reverse and move on, so our driver reversed and hit a car parked behind us. After he was hauled out of the car, pushed around and shouted at for a long time, he was forced to pay the driver of the car behind for the damage and we eventually continued in our journey. About 3 hours later we reached our destination at the entrance to the Masai Mara Game reserve and camped there for the next 2 nights. We saw lots of animals at the reserve but mainly from a distance, which meant my measly 2x zoom had no chance of photographing anything. In the evenings we were cooked for and played cards until 9pm (when the lights were turned out), when we crashed out in our luxury tents. While we were there we had the opportunity to meet some of the local Masai warriors from the neighbouring village, who put on a dance for us (for a small fee). On the way back to Nairobi we were held up for 2 hours by a traffic jam caused by the closure of a complete section of motorway. The diversion sent us onto the opposite side of the road where we managed to creep along until it was time to return to the open section of motorway. The slip road was just wide enough for 2 lanes of traffic but had cars on the right side of the road and wrong side of the road edging in all directions. Meanwhile a large digger was reversing into the traffic while men screamed and waved little coloured pieces of material at each other trying to control the flow of traffic in their friends' favour. Our driver held his own and was probably the best driver out of the whole bunch but had the finger pointed at him as if he had caused the chaos. Miraculously we did manage to escape onto the motorway but it really drained the remaining energy out of us and everyone was tired and grumpy for the rest of the journey back to the hotel. The next day we joined the big truck and after a trip to the supermarket for supplies, set out on our way to Tanzania. We had been warned that the road was the worst we would encounter throughout the whole 42 day trip but being at the back of the bus (last on...worst seats!) certainly made that experience worse. I had started to feel unwell after the first hour or so and spent much of the journey across 2 seats, with attempts to sleep hindered by the frequent bumps in the road that sent me over a foot into the air each time! From the truck we could see the construction of the new 'road' but we had to travel for 3 hours on little more than a dirt track. 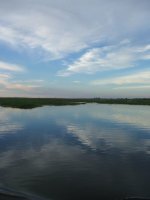 By the time we crossed the border and traveled the much shorter distance to camp (at the alligator farm), I had a fever and was laid up in my tent until morning. 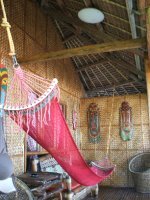 My husband had been ill with the same symptoms in Thailand, which we worked out was 48 hour flu, but there was a niggling worry that I might have been sick with malaria. 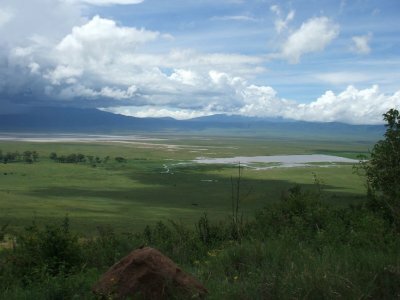 The next day one of the other girls came down with the same symptoms, but I already felt a bit better and didn't want to miss the trip to the Ngorongoro Crater and Serengeti. 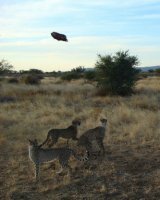 We set off in Safari vehicles that evening, passing through villages, watching people selling red bananas and seeing countless baboons on the road and in the trees. We reached a very muddy camp and spent our first rainy night sweltering under a damaged and unbreathable tent cover. Early the next morning, after taking down our tents in the dark and eating beans on toast for breakfast, we set off for the crater. It was surprisingly cold as we drove up the muddy road. We stopped briefly at the entrance gate to use the toilet and were met with a sea of dung beetles, crawling in and out of the toilet basins and all over the floor! It really was a stark reminder of what toilets are used for! As we passed the entrance the road narrowed and followed a continuous turn right round the crater. It was misty and progressively colder as we went further up. I had to add more layers of clothing and zip up my jacket until only the smallest hole was left exposed on my face. We couldn't gauge the height we were or what any of the surrounding scenery was like through the mist until we reached the top of the crater. The view from there was breathtaking and as we descended the 2000ft into the crater, it just became more and more magical. Somehow the animals seemed happy there; Impala skipping about and playing with each other, zebras rolling about on the ground, and countless other animals, living together harmoniously. The elephants were the largest and oldest we saw throughout the entire trip, and we encountered our first group of lions, just feet away from us. 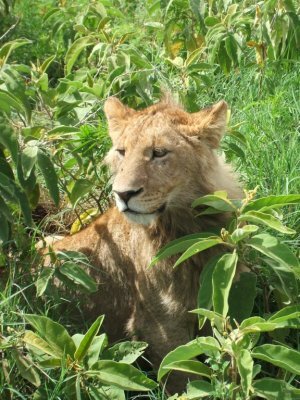 After our morning game drive, we left the crater and continued on the 2 hour journey to the Serengeti National Park. The views everywhere were stunning, and we spent nearly the entire time hanging out of the roof and letting the wind and dust batter us. 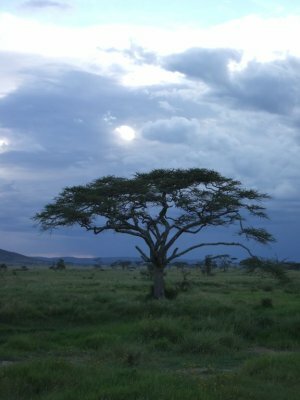 Once we reached the park we had an afternoon game drive and then journeyed deeper into the Serengeti to set up camp. We spent the evening sat round a camp fire and watching the stars. Early the next morning we had breakfast, packed up our tents and set off on a morning game drive. It didn't turn out to be particularly productive, but we did get a distant view of a leopard sitting in a tree. The leopard was one of the few animals we hadn't already seen but unfortunately neither my eyesight nor camera were up to the job of getting a clear view of it. I did get some pretty good pictures of other animals that morning however. We spent that afternoon on the long drive back to camp at the crocodile Farm, where our truck chef had prepared a barbecue. Everyone had seen pretty much the same animals but it seemed that our driver was the most proficient at finding them first...and we had the photos to prove it! Our next destination was Dar Es Salaam, on the coast. We spent some of the afternoon in a bar there and then continued on to our beach campsite. It was lovely there, with the beach just outside the gate, hot showers and a nice bar area. We only spent one night there before being dropped off for the ferry to Zanzibar. 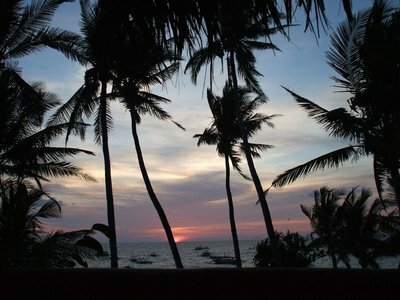 We spent 3 nights on Zanzibar, the first sightseeing in Stone Town and the next 2 relaxing on the white sandy beaches. 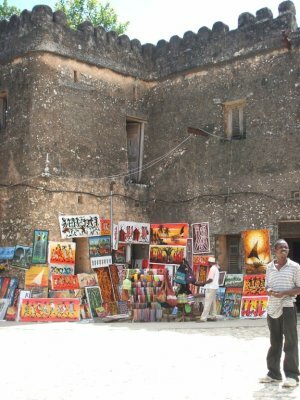 Stone Town is run down but with some interesting historic buildings relating to the slave trade. 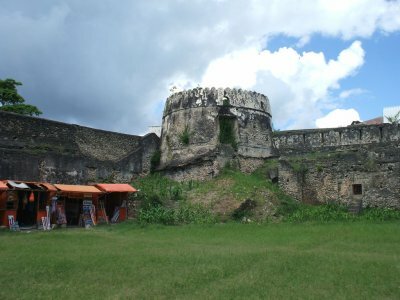 We went on a day long Stone Town and spice tour while we were there. The tour guide was a very strange but amusing guy, who spoke in a mixed jumble of different accents despite the fact he has never left Zanzibar! He took us round the historic sites, some of which we very poorly maintained, then we ate lunch at a local woman's house. She made an amazing beef and rice dish that was flavoured with a little of every spice grown on Zanzibar. The final and best part of the tour was to the spice farm. We saw examples of the plants, smelled the spices, drank lemon grass, masala and ginger tea and watched a guy climb a coconut tree with only a rope between his ankles! The next few days were pretty uneventful and we couldn't sunbathe much because it was either cloudy or raining on each day. Some of us had massages and pedicures from the local women along the beach. They weren't particularly expensive but the women were completely untrained and didn't really do a good job of either the massage or pedicure! I think it's necessary to go more upmarket to benefit fully from the Zanzibar experience. The boat journey back to Dar Es Salaam was horrendous! Everyone was given sick bags at the beginning of the journey but none of us expected we would be as sick as we were. Shortly after the boat left the harbour I started to feel unwell and most of us went outside and sat on anything available. For the next 2 hours everyone on the boat was being sick and felt nauseous until the boat arrived at the port. 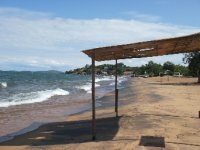 After two more nights in Tanzania, we crossed the border into Malawi. I didn't know what to expect from Malawi. 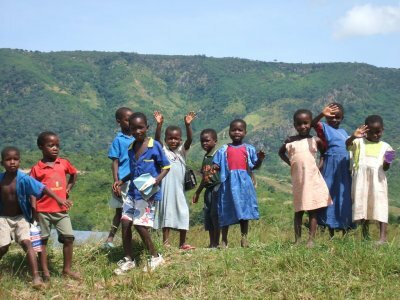 All I knew was that it was a very poor country where many organisations had helped to build schools and hospitals and to provide donations of money, clothes and medical supplies. The reality reflected these pre-conceived ideas but I was surprised by how pretty it was. I had never imagined what it would be like to swim in a freshwater lake that was so big it looked like the sea. 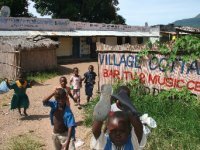 We went on a walk through one of the villages and visited the local school and hospital. The walk did bring the reality of the educational and medical situation home to me, but I didn't feel the expected sensation of shock or pity at the simplicity of things. The teacher in me looked at the action plans in the Head Teacher's office and tried to understand the school issues in context. 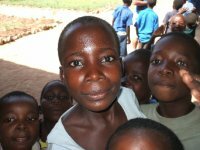 I considered how it would be possible to provide a good education to so many pupils in dark classrooms with no resources, but realised that in Malawi there are many basic issues to deal with before education can take precedent. After spending 5 days in Malawi we crossed the border into Zambia. We didn't do much besides driving for the next few days since Livingstone is at the far West of the country. The supermarkets were notably better but more expensive here and the effect of tourism was evident in the standards of our campsite. 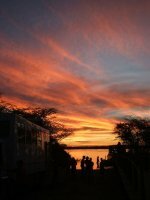 The complex had everything from smart hotel rooms to chalets and tent pitches, with a restaurant on the bank of the Zambezi River. From here it was possible to see the distant spray from Victoria Falls but the good view came when we crossed into Zimbabwe the next day. 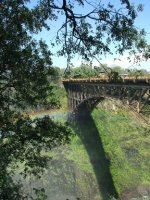 Crossing the bridge into Zimbabwe was the first impressive view we had of the Victoria Falls area. 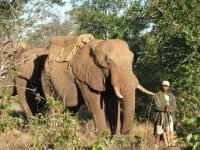 There were so many opportunities for adrenaline activities and animal interactions here. 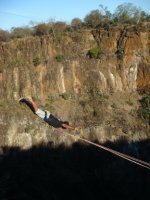 As well as visiting the Victoria Falls National Park we walked lions, rode elephants and threw ourselves off a 100ft gorge! It was a fantastic 3 days! 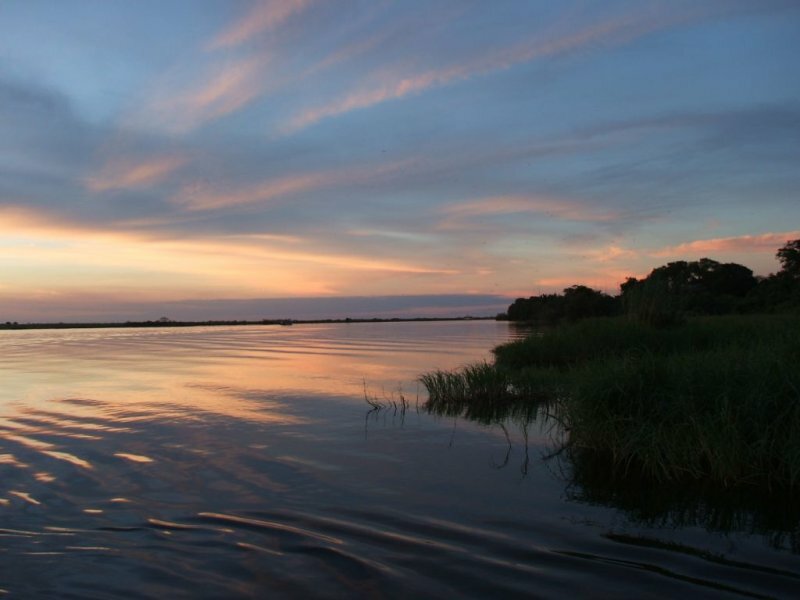 We arrived into Botswana and spent the first evening on a game cruise on the Chobe River. 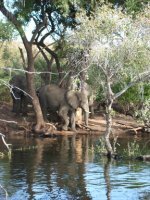 It was a very calm way to see the animals in their natural environment and an opportunity to watch young elephants playing with each other on the shore and even one that had immersed itself in the river up to his neck. The sunset was absolutely beautiful as we cruised back to the jetty. 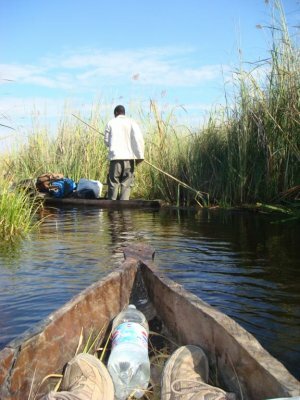 The main attraction in Botswana was the Okavango Delta. We travelled with people from the local village by Mokoro to a remote spot, about an hour into the delta, where we set up camp for the next few days. 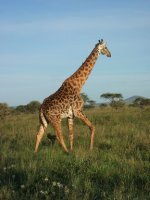 We saw hippos, giraffe, elephants and reed frogs during game walks and mokoro rides. We could drink the water from the delta and also swim amongst the reeds, although the water was pretty cold! 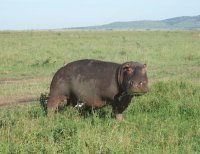 On a trip further up the delta we saw large amounts of hippos, not pleased to see us invading their territory. They grunted loudly, splashing water in our direction and one thrust himself into a barrel roll in the water. At night we ate around the campfire, sung songs and watched the locals perform for us. It was a very relaxed time, in pretty surroundings. 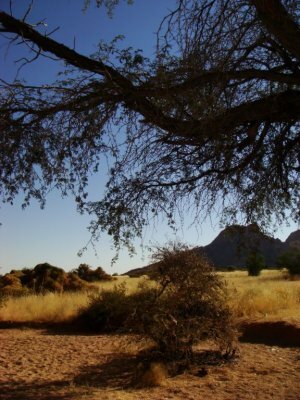 We had been prepared to experience something special in Namibia, since everyone we spoke to leading up to our trip there had told us it had the most diverse and beautiful geography across the country. I was looking forward to seeing this but my real excitement came from the prospect of some adrenalin activities. Our first stop was at Etosha National Park. We were camping but we did get to experience a small part of the wealthy person's holiday in Africa here. The main park building is in the shape of a castle fort and has restaurants, shops, a guest lounge and a swimming pool. Most guests were staying in chalets near to a watering hole, which is lit up at night to allow people to observe the animals visiting the area. We were lucky enough to see and video three giraffes drinking from the watering hole after only an hour of waiting. 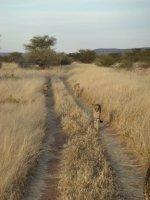 During the 2 game drives we had while at Etosha we didn't see much wildlife. On a night drive some of our group saw some rhino, but we had definitely seen more animals, closer on our visits to other game parks. 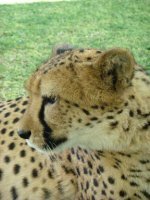 From Etosha we drove across the park to a Cheetah park, where we camped for the night. There we saw wild cheetahs being fed and could stroke the owners' pet cheetahs. They were surprisingly friendly and similar to domestic cats. They purred while being stroked and licked some of us (which apparently felt like being rubbed with sand paper!). 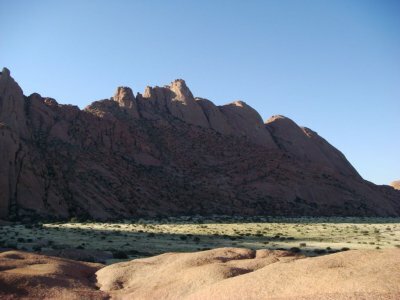 From the Cheetah Park we continued on our journey to the beautiful mountains at Spitzkoppe. Some of the group went on a tour round the area to see cave paintings and find out a little of the history. Others climbed the mountains and took photos of the amazing view. In the evening we made a fire and eventually camped under the stars. 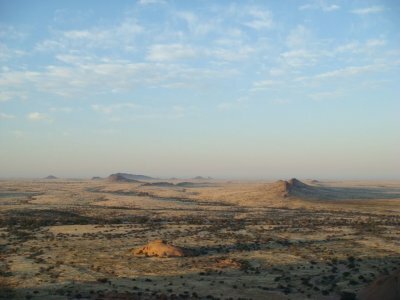 At dawn, a group climbed the mountain to watch the sun rise, before having breakfast and starting the journey to Swakopmund. I was getting increasingly excited as we got closer to the African / German seaside town. I played music I used to listen to in the car on the way up to my 'local' dropzone in Scotland. 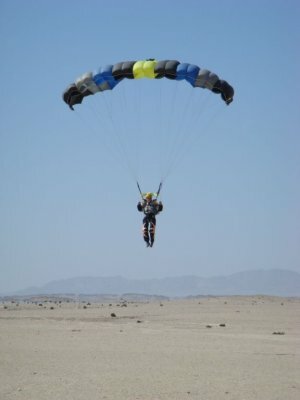 It had been two and a half years since I had last jumped out of a plane and my adrenalin was already pumping before I had found out where the airport was in Swakopmund. We stopped at our hostel, dropped off our things and went straight to the adventure sports booking centre. I was keen to head to the dropzone to get some refresher training but we also booked on a beginner's sandboarding course. Some of the group came along to do a tandem jump and I managed to get 'refreshed' by one of the parachute instructors there. Unfortunately the winds were too high to get anything done that day but we went back the following morning. I managed to borrow equipment and do 2 amazing jumps. 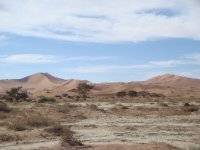 The scenery is beautiful above Swakopmund, with the sand dunes bordering the town, the bay in the distance and the massive expanse of desert. It was almost difficult to find the little dark squares so far below, that were in fact the DZ packing huts. After a night in the hostel bar, drinking cocktails and watching tragic 80s music videos in the bar, we went to bed in our dorm room, to prepare for sandboarding in the morning. Half the people on the course were beginners and it didn't take long to realise that sand is pretty unlikely to kill you. It was easy to control the speed we went but not so easy to maintain balance. 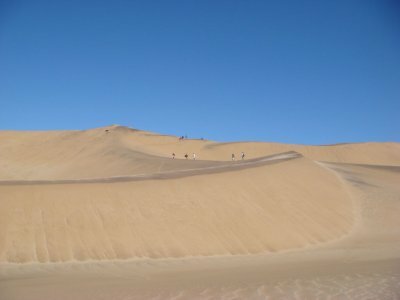 The sandboarding was fun but climbing the dunes to do it was torture, and enough to take it off my desirable hobbies list. Swakopmund is a sleepy but attractive town with a strange mix of cultures and a strong German influence. White people are very much the elite people here and it was strange to be submerged in an environment that didn't feel wholly politically correct. 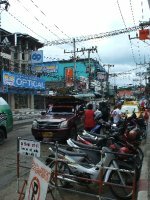 There was access to good food, bars and restaurants but the tourist market is aimed at a much wealthier person than the average overland truck traveller. 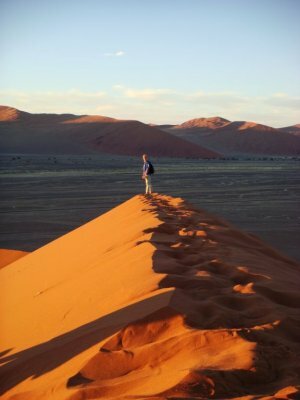 After three days of action packed activities in Swakopmund we continued on through the desert towards Sossusvlei. Here we were able to take a guided walk through the desert and learn a little about the history, people and survival skills necessary to live in the area. 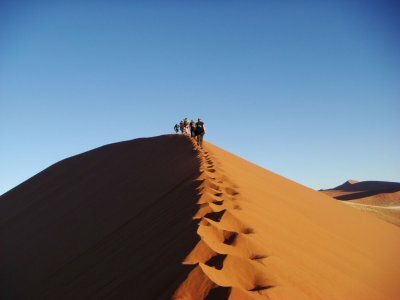 On the way back to camp from Sossusvlei we stopped off to climb one of the largest sand dunes in the world, to watch sunset. The climb to the highest point was very tiring and took about 30 minutes. We were so high and the path was so narrow (as wide as a person) that I felt quite nervous of falling off the dune. Besides never being able to clamber up again it wouldn't really have been a problem though. On the way back down, most people ran down the side of the dune and walked for about 15 minutes to get back round to the truck, whereas I decided to walk back the way we came (which turned out to be a bit quicker). 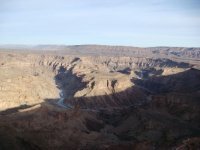 Fish River Canyon was our next destination the following morning and we arrived in time for sunrise. The canyon is the second biggest in the world, next to the Grand Canyon, and having seen photos of the Grand Canyon since, it is almost equally as impressive as it. On the way to the Namibian border we were able to stop off at a local butcher for some chlli kudu biltong. It was never something I had eaten or wanted to eat before heading to Africa but there's something quite amazing and addictive about biltong when you're sitting on a truck driving for days on end. 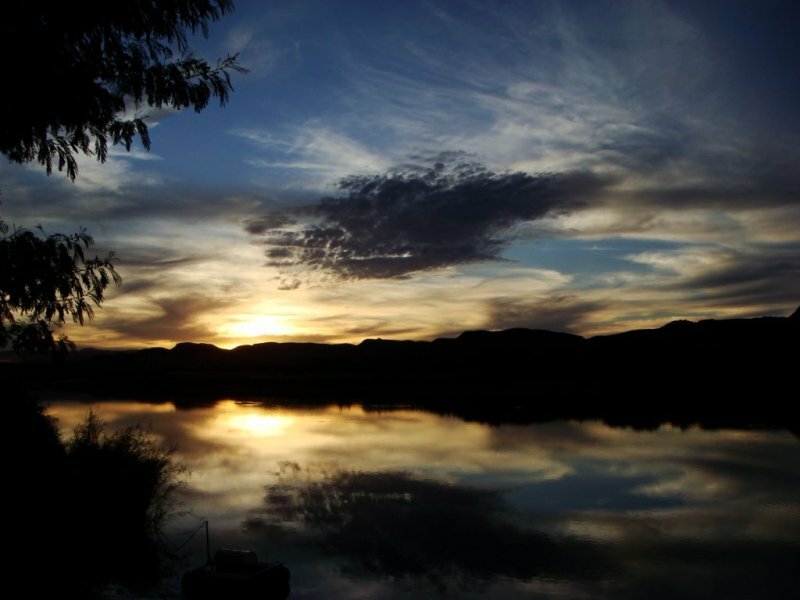 Our first stop in South Africa was at Orange River, where we had the opportunity to go canoeing or just relax by the river or at the bar. 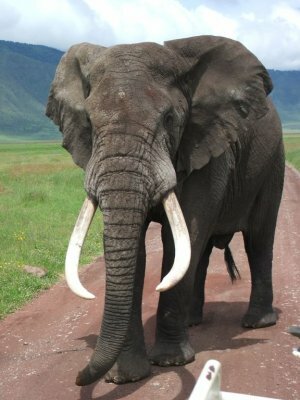 By this time, we had lost virtually all traces of 'real' Africa but it was quite a welcome trip back to civilisation. We spent the following night at a wine farm, where we camped in a storage building for the night. We had the opportunity to do very generous wine tastings of some of the wine produced using grapes grown at the vineyard (and it only cost £5). After everyone was suitably tipsy, we were able to buy bottles of the wine cheaply at the bar, and the party continued into one of the latest nights of the trip. The next day we drove until we arrived at Cape Town, where the official overland trip ended. 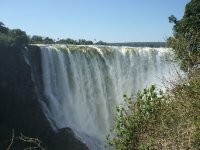 We spent 3 rainy days in Cape Town and met up with some of the people who had left the trip 3 weeks before at Victoria Falls. Unfortunately we were very short of money by this time and couldn't afford to go to Table Mountain, but we did manage to see 5 films at the very reasonably priced cinema. 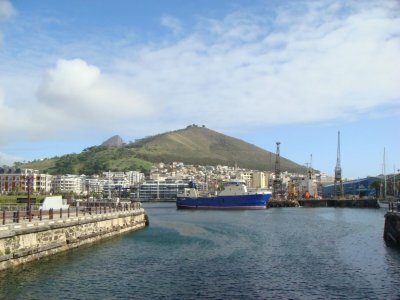 Cape Town is a very attractive city but didn't feel particularly safe, with all the beggars, homeless and prostitutes. The restaurants had a good mix of food and it was possible to pick up souvenirs from nearly all the countries we had seen on our trip and have one last ditch attempt at haggling the price down. Unless you have a lot of cash to spare however, don't fall into the trap that you might send home your souvenirs to save money...one of the people we knew were quoted about £300 to send home their array of wooden animals and masks. 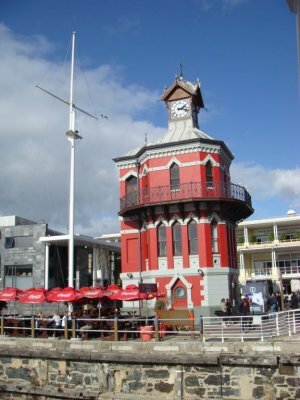 Hostel prices in Cape Town were affordable and most will offer reasonable transfer prices to the airport. By the time we had reached the final couple of days in Cape Town we were glad to be going home. I say home but actually for me, heading to Conneticut for the next three weeks was also something new. For my husband it was going to be the first time he had been to the States since moving to Taiwan two years before. 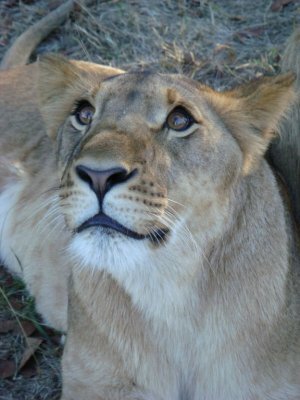 We had waited for a year for our Africa trip and it was no disappointment. It was definitely the best way I can imagine to spend 48 days of my life and I recommend it to anyone with an ability to rough it, sometimes with cold or no showers, early mornings and long days spent on a truck, traversing Africa's interesting roads. We met lots of people, some interesting, some annoying, some smelly! I speak mainly of our fellow passengers on the truck, not the locals along the way (although the same is true of them also). We saw the best of every country we went to, without feeling too much like rich western tourists. What I valued was the opportunity to truly relax, whether it was on one of the long journeys by road, on the beach in Zanzibar, sitting round eating dinner at night, or in one of the many campsite bars. It was an escape from real life and the opportunity to observe other countries and try new things. A truly fantastic experience! 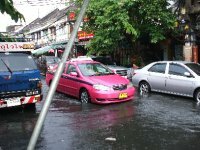 We arrived into Bangkok with a reservation at a hostel in Rambuttri Road and a rough idea of how much to pay a taxi driver to take us there, but that was about all the research we had done. We bought a cheap Lonely Planet guide on the first day (2004 edition) and flicked through to find some points of interest. After we left the hostel it took all of about 5 minutes to be approached by a guy, claiming that the local police station was a tourist office and we were ushered inside, where we were given a map and all sorts of 'useful' advice about where to go and where not to go. 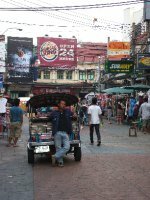 Then he offered us a 60baht tuk tuk ride which would take us to the 3 'most important' places, since the others were 'closed' at that time. Since it was so cheap we jumped at the chance and were pretty happy when the tuk tuk driver let us stop off to buy water and use the ATM machine. Alarm bells only rang after we had visited the 'only legitimate' TAT office to book tickets to places we hadn't decided we were going to yet. 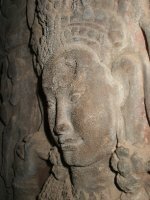 We casually mentioned Cambodia and were offered a 'discount' trip by minivan, with 3 nights accommodation at a Hilton Hotel for 'only' 9000 baht each. We had a budget of 20 pounds a day including accommodation, so there was no way we were going to book anything on day 1 especially at that price! So we thanked the agent and went back to the tuk tuk. For the next few minutes we were quizzed by the tuk tuk driver about what trip we had booked and when we said we didn't book anything he got annoyed and dropped us off at the next street corner. We realised after a few days that the tuk tuk ride had merely taken us round the block to the places we could walk to from our hostel, but what the hell we were only conned for 60 Baht! One fantastic thing about Thailand is how cheap it is to use the internet...especially in Bangkok. The Green House Guest house has a number of different payment systems for the internet, the best being 99baht for 10 hours! You are given a piece of paper with a code that will deduct the time used, and is valid for 2 weeks. Because of this, we were able to Skype home, upload photos and research everything we needed to know about traveling around Thailand and Cambodia. Rambuttri Road is in the backpacker area of Bangkok, far enough away from the noise of Khao San Rd and only a 5 minute walk away. The whole of this area is full of travelers and shops and street stalls geared to selling us all our souvenirs. 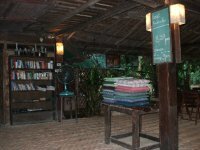 They sell cheap T-shirts, dresses, scarves, jewellery and lots of New Age traveler style clothes and merchandise. The area's bustling with a good atmosphere, and reminds me of Brighton somehow. 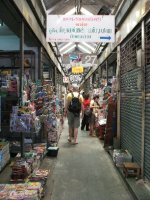 We visited the weekend market at Chatuchak during our first week and as well as getting lost and not being able to work out where we came in, I picked up some real bargains on bags, Thai fishing trousers and leather sandals. 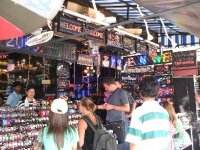 Prices range from about 100 to 250 baht for most popular items. 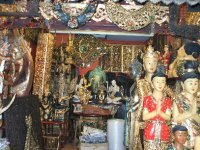 We went to a couple of the big temple areas in Bangkok which were within walking distance but the April heat made everything feel further away than it was. 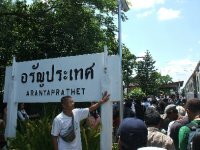 We were trying to avoid taking tuk tuks or taxis because the drivers were always lying about tourist sites being closed and trying to overcharge grossly for every journey. We learned from someone we met that the cheapest way to get to the main shopping areas (e.g. Siem Paragon Mall) was by river boat and cost only 8 baht each way! Siem Paragon is a large mall with an impressive food court, International bookshop, brand-named clothing shops and a cinema complex with IMAX and deluxe theatres. It is one of a selection of malls in the area, within walking distance from each other. 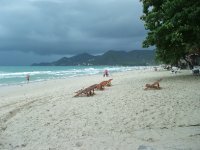 Our first excursion out of Bangkok was to the popular tourist island of Koh Samui. 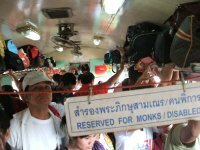 We booked our tickets at a tourist office on the first floor of Hualomphong Rail Station and paid about 1200 baht for a one way ticket by 'luxury' bus and including the boat ticket over to Koh Samui. It was an over night trip on a coach with toilet and TV showing English films. The seats reclined and we had air conditioning and a blanket. The first bus was pretty comfortable although I found it difficult to sleep. We arrived into a run down drop off point and had to wait over 2 hours for our connecting bus to take us to the ferry at Surat Thani. The next bus was very different, with broken windows and fans on the ceiling, but we were only on it for an hour or so. 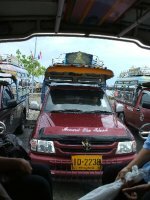 The ferry was also run down and the journey across to Koh Samui was pretty rough and took about 2 hours. At the port we took a pick up truck to Chaweng Beach which took about 45 minutes and then walked around until we found a hostel we liked the look and price of. We were easily able to stay on budget at 540 baht per night for an aircon room, close to the beach. Unfortunately our plans to chill out for 3 days on the beach were hindered by the constant rain and storms throughout our time there. The beach was reasonably pretty but not as great as we expected. The better beaches seemed to be in the areas of the island less accessible. We spent most of our time on the island reading, eating at the local restaurants and enduring power cuts and storms. After three days on Koh Samui we decided to cut our loses and head for somewhere far away from the popular beach resorts of Southern Thailand. 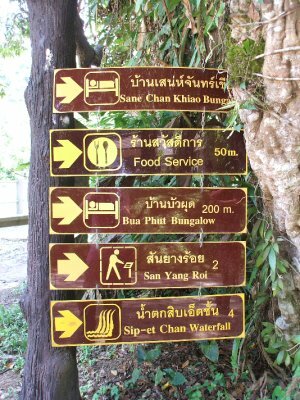 We booked a ferry and minivan package to Khao Sok rainforest in the Suratthani province. It was not as easy to find accommodation here as we had hoped, since the 'hotels' were spread quite far apart and were not easy to find. We managed to avoid the touts by telling our taxi driver we were staying at one place, and once he had driven off we started looking for somewhere else. 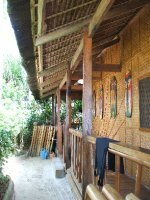 We ended up at Our Jungle House, a place listed in the Lonely Planet guide. 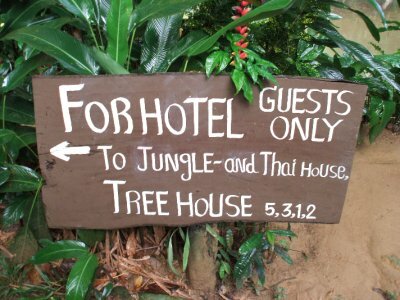 It was a bit more expensive than others and set about 10-15 minutes walk away from the main road but its location was so beautiful and peaceful it was worth paying 800 baht per night for a treehouse. 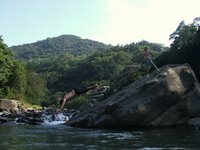 The resort was located on the bank of a river, overlooking a high cliff on the other side, which gave the place privacy and a lovely view. The restaurant served amazing and cheap food and stayed open until 9pm each night. 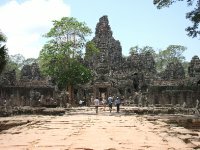 We were trying not to spend too much money so we didn't go on the excursions offered by the resort but we were well aware that there was a vast area to explore. 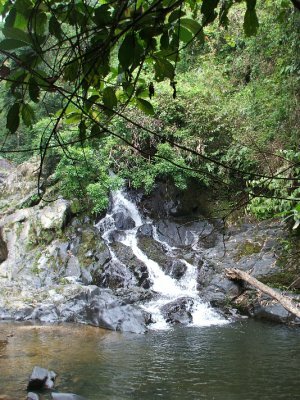 We went into the National Park once and chose a trail that seemed of a manageable distance (4km). 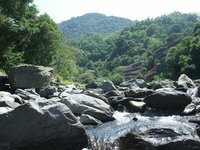 Guide books had described the trails as well signposted and easy to navigate alone but our experience was very different. 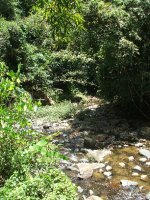 Our trail started off reasonably easily, with steps and bridges and clear walkways, but became progressively steeper and narrower. There were points at which, due to mud slides the path had been entirely washed away and we needed to hold onto trees just to stop us slipping down the steep embankments. The path ahead at each point seemed noticeable but signs were few and far between. We needed to cross the river 6 times along the trail and on some occasions the only way across was to wade areas about 2-3 feet deep. All enjoyment ceased as we started scratching and found leeches stuck to our ankles. They were not easy to remove and we had to pull them off through our bandanas. We were both wearing long trousers but even tucking them into our socks didn't stop more leeches from working their way into our shoes and socks everytime we stopped to take a breath. 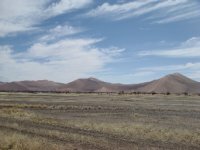 We both started to become dehydrated, but without knowing how far we had walked or whether the trail proceeded in a loop of 4km, we didn't know whether we would be traveling further if we turned back. After 2 and a half hours we had made it to the waterfall. I was feeling incredibly tired and sick by that point and was then worried that we needed to turn back and cover the same 4 km distance but with no water and potentially only a couple of hours until sunset. I felt totally stupid at how unprepared we had been, setting out as if it was a stroll in the park with only a couple of litres of water between the two of us. I was worried that if we took as long to get back it would be too dark to see and no one actually knew which trail we had taken. So after I had a bit of a breakdown, we set off as fast as we could and managed to save an hour on the journey back. Once I got back to the park, I was barely able to drink any water and vomited by the side of the cafe. I spent the whole night with a headache and being sick every time I tried to drink water. 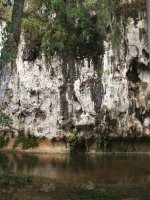 We spent the next day and in fact the rest of our time at Khao Sok sitting in the restaurant, reading and playing cards. One day we went swimming in the shallow river and found a pool where the fish nibble at your feet. 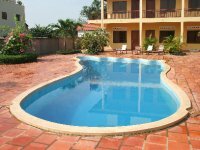 There were only a few other guests and so there really was a sense of seclusion at the resort. At night you could hear the insects and animals pretty loudly outside the tree house but their repeated hums and drones made it easy to sleep. In the restaurant you could see toads and lizards and fireflies, undeterred by the mosquito coils that we needed to have burning constantly. 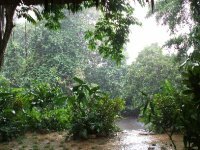 Every afternoon we would sit under the palm roof listening to the insects becoming silent, the trees whooshing and then watching the torrential downpours of rain. Khao Sok was a perfect place to while away 5 days. We returned to Bangkok by overnight bus and booked into our previous hostel for another few nights. 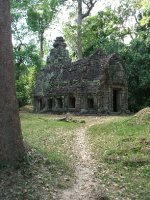 We researched where to go in Cambodia and decided that it would be very interesting and very cheap to go by 3rd class train. I had read reviews of the journey and although it sounded like a rustic and long journey, no one had reported any problems with it. We needed to turn up at Bangkok's Hualamphong Train station early to buy our tickets for the 05.55 service to Aranyaprathet. 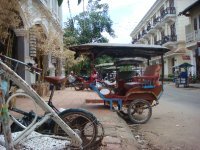 That meant leaving the hostel at about 3.30 to make sure we would have time to get a taxi or tuk tuk for a reasonable price. A journey to the train station should only cost 60 baht but we never got it cheaper than 100. "The atmosphere at Bangkok's Hualamphong rail station is pretty relaxed, where foreigners and locals vie for spots on the floor while they wait for their train. The station is old and dirty but with modern amenities like Dunkin Donuts, KFC and a number of other eating places and travel agents. Besides the noise of bustling travelers, is the sound of a local radio station and the occasional muffled Thai announcement. One rather interesting feature, next to the fixed Departures and Arrivals boards, is the photos and paintings of the King of Thailand. 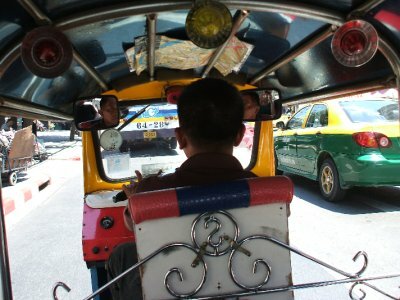 There are images of him everywhere in Bangkok and people here seem to take the monarchy very seriously." " It's 5am and the station is already buzzing with people who, I assume are taking early trains home to prepare for Thai new year. Hawaiian shirts seem to be popular at the moment, or it could just be a coincidence! We're heading for Cambodia today and I'm already scouting the western faces for couples we might eventually share a taxi with, once we get to the other side of the border. I was a little nervous about the journey before, but now I've read a few people's recent experiences of the border / customs crossing I feel alright." ...Our hotel is really nice and the guy at reception speaks good English. The hotel is modern, with a nice restaurant area and a footprint shaped pool (the logo for the company). I'm starting to get into the groove of traveling now and even though yesterday's 8 hour train journey was a struggle (with no seat and a carriage packed so full we were struggling to find a place for our feet at times) we can at least say that we did it like the locals, and only paid 48 Baht for the privilege!" After spending a few days to recover from our long journey from Bangkok, we booked a tuk tuk driver from the hotel to take us round Angkor Wat and the temple complexes. 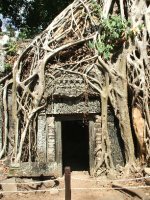 It cost 15 dollars per day for the driver plus 40 dollars each person for a 3 day entry ticket for the temple complexes. We managed to explore for 2 whole days but were templed out by the end of day 2. Cambodia has it's own currency (Riels) but there is definitely a two-fold currency situation at work in the country. 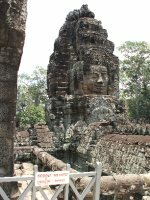 For the tourist everything is priced in US dollars, and Cambodians are very used to tourists so the prices for everything are inflated. All of the ATMs give out money in US dollars so there's no need to bring much into the country, except for your initial taxi fare from the border to Siem Reap. My husband and I found the food mediocre compared to Thai food but were aware that we had moved further East and West is definitely where the food gets better (in our opinion)! 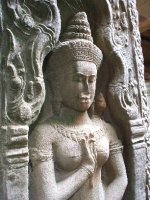 Anyway, I decided that despite the fact that shopping was a little worse and more expensive than in Thailand I liked Siem Reap because it has retained a feeling that it is in some ways less explored by outsiders. The markets are dirty, and poorly lit but are inviting, with many little shops with items you can't quite identify. Cambodian silk products are everywhere and we picked up a woven elephant double bedspread for only 15 dollars. 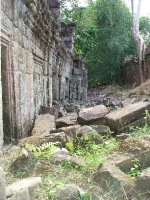 Cambodia is a very poor country and there are many beggars on the streets and around the temple complexes. 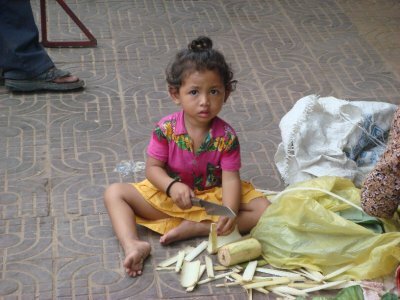 It's very common for young children to be put to work, whether it is by selling local souvenirs, begging or steering tourists to their parents shop or drinks stall. The little girl above was sitting in the street outside the market with her family; none of them watching that she doesn't hurt herself with the huge knife they gave her! 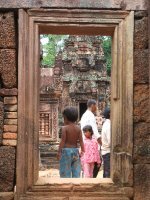 I thought I would feel pity when I saw Cambodian children on the streets, but I came away feeling anger that the parents manipulate their children for money; creating a society of street wise, dishonest and manipulative children, who have no sense of personal pride. Of course westerners have the luxury of wealth and opportunity, but it seems to me that Cambodia lacks even the most basic notion of child protection, hence the shocking figures for child prostitution (35% of prostitutes are apparently under 18). Across the road from the Old Market is the French influenced part of town. Many of the restaurants and bars have very charming architecture. There is one street in the French Quarter devoted entirely to tourist shops, restaurants and bars (known as Pub Street). 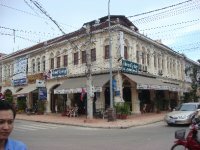 There is a good atmosphere on Pub Street and a variety of International restaurants. 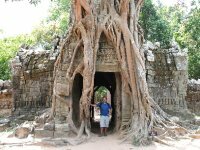 We spent 5 days in Cambodia, which was enough to visit the temples and experience some of what Siem Reap has to offer. 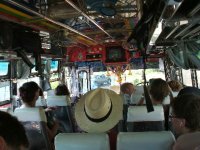 We booked a bus journey back to Bangkok that cost only 11 dollars each, and despite the first 3 hours being on a slow government bus to Poipet, the minivan waiting for us on the other side of the border provided a comfortable and speedy means backs to the city. We didn't do much on our last few days in Bangkok. We went shopping, watched a film at the IMAX and spent the rest of the time around the hostel, enjoying our last few nights sleeping in a bed before heading to Kenya for our 7 week camping trip. 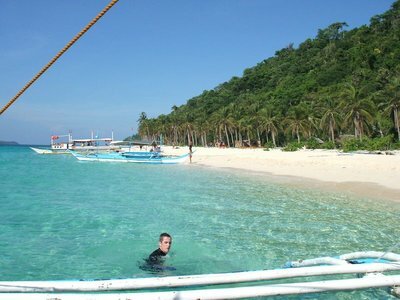 It was nearly 2 years since I had been to Boracay. 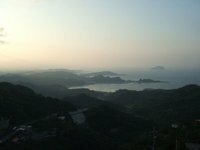 Last time I was a lone traveler, looking to escape a hectic work schedule in Taiwan. This time however, I was coming for a very different reason. I had recently left my job, moved from Taiwan and was planning a big trip around the world with my new husband. 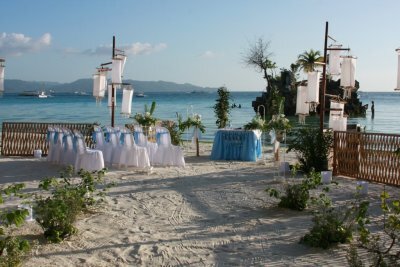 Boracay was the first stop, but more importantly, the place where we would have a wedding ceremony for our friends and family. The hotel where we booked our wedding (Nigi Nigi Too) offered a basic package that suited our budget. 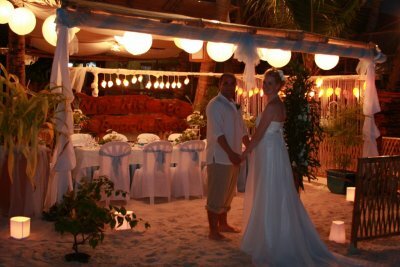 We had a beach ceremony with flowers and a private eating area for the evening. On the whole they did a good job but there were 2 big problems we had with the hotel. Firstly the woman organising the wedding ordered the wrong coloured flowers (pink instead of blue), and tried to blame the mistake on us, even though we could show her the confirmation e-mail she sent about the blue and white colour scheme! Secondly when our guests went to pay their bills, they were told there would be an 11% charge added for using credit or debit cards - Other hotels charged 3.5%! Our solution was to take out cash from the ATM but that took a few days to draw enough and ATMs are pretty unreliable on Boracay. The location was great for a wedding. 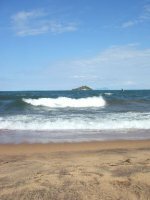 It was along the far side of the beach, where fewer people wandered, and had the famous 'rock' (man made though I think!) as a backdrop to the photos. We had a fantastic day, ending with some of the guests out in the water for an evening swim in a storm! Our guests stayed for a week on the island and all had a good time, especially the females who liked pearl shopping. 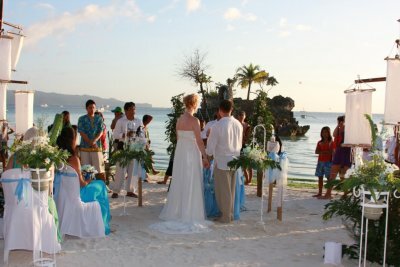 After our wedding guests went home, my husband and I downgraded our hotel and moved to the Casa Pilar Beach resort (where I had stayed on my last trip to the island). I could already see changes on Boracay since my last visit and while the price of the hotel was the same as before, it had lost a little of it's previous tranquility. I could hear a continuous bass from the 'Pirate' bar next door and hammering at the building site on the other side. 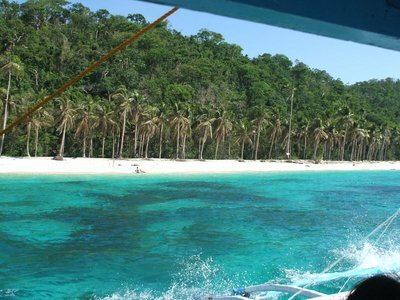 Boracay island is getting more commercial, with further hotel developments and the new Starbucks, which was preparing to open on the beach. These things aside, the beaches are still beautiful across the island, the people are friendly and the weather gets better as the monsoon season passes. There are many mediocre eating places on Boracay but some restaurants serve amazing food. 'True India' is a barn-style restaurant with low wooden tables, reed mat floors and big cushions to sit on. The food is great and the ambiance is very relaxing. The owners could make better music selections, but you can't have it all! For Chinese food, we went to the Regency Hotel. It looks posh, costs a bit more than your average restaurant but makes fantastic chicken with cashew nuts and sweet and sour pork. There are many activities available for those who having the money (unfortunately we didn't on this occasion). You can do various water sports (scuba diving, snorkling, parasailing etc), quad biking, or go on a boat trip or sail boat. 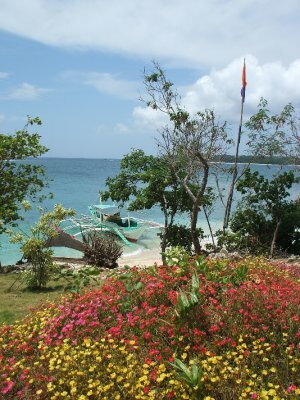 Prices are reasonable and it's a nice way to get off the beach and see different parts of the island. 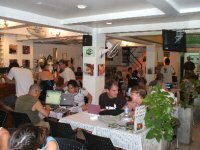 There are a number of foreigners living on Boracay, most with restaurants or hotels. One guy told us that if you watch Lock, Stock and Two Smoking Barrels you will see most of the characters represented on Boracay! I finished working a week ago and realised, for the first time in so long, that I had time to think and to process how my life has changed since I moved to Taiwan over 2 years ago. I have a feeling that the full impact of my time here won't hit home until I actually leave though. I left the UK with aspirations to travel, to see new things, meet new people and explore a new culture. There was nothing unique about my goals and I have realised that most English Teachers abroad tell a similar story. Some people, like myself, had always wanted to travel but had to wait for the right time in their lives to do it. Others made a quick decision and acted on it. Some people ran away from problems at home and some moved abroad to save money to pay off debts. I have met a lot of people in Taiwan, some good, some boring and many weird! Culturally I find Taiwanese people difficult to relate to, which is probably why I have less Taiwanese friends than foreigners. In my work life I have encountered many irreconcilable situations, which are often based on our differing perspectives on how things should be done. I liked working at my last school but I believe strongly that work conditions fall well short of those in Britain. School managers use bully tactics (more on the Chinese staff than on foreigners) to get what they want and have completely unrealistic expectations of their staff. In general Taiwanese completely lack directness, which means there is often very poor communication in the workplace. 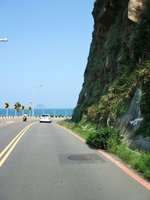 Teaching English in Taiwan has not allowed much travel to other countries, partly because I wanted to save money for a big trip but mainly because most schools offer unpaid holidays that are only around 3 weeks per year. 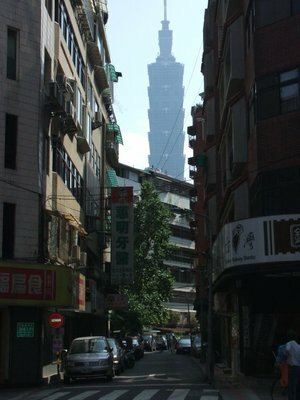 I have done a little travelling within Taiwan, and enough to gauge the difference between city and country. 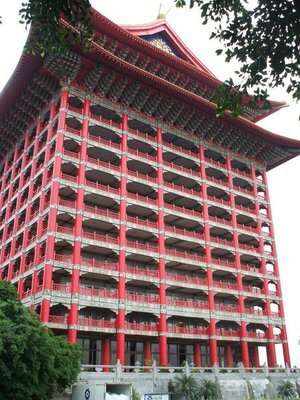 I'm on the whole disappointed that there is no pursuit of beauty in Taiwanese architecture or any sensitivity to the environment. Formosa is the original name of Taiwan and it means 'beautiful country', but I believe the days where that was true are long gone in Taiwan. It's not possible to simply sum up my experience of living in Taiwan. In preparing to leave I have realised that I don't hate the place like I once did and spending an extra year here has led to a familiarity and comfort with Taipei. There are not many people left here that I would call good friends but I will really miss my Taiwanese ex-flatmate, who has become like a sister to me. The best thing to happen to me here is meeting my husband. We married in Hong Kong in February and will be having a ceremony for friends and family in the Philippines in March. The next chapter begins with the big trip to Thailand, Cambodia, Kenya, Tanzania, Zambia, Zimbabwe, Botswana, Namibia, South Africa, the US and the UK. Then my husband and I will be moving to Egypt in August, for the next 2 years. The final 6 months in Taipei! View The Big Trip & Taiwan on lucid's travel map. After living away from home for a year and 8 months it's time to plan the big trip and get organised for leaving. I spent a few hours in the International bookshop during my summer break, researching possible destinations and taking notes from travel guides about visas and inoculations. Getting visas in Taiwan is likely to be a problem. Due to Taiwan's ambiguous political status, many countries do not have embassies or representation here. I'm hoping that my travel agent will be able to help me or maybe I'll have to get them in a more 'connected' country after I leave. At this stage I'm trying to plan, without panicking too much. 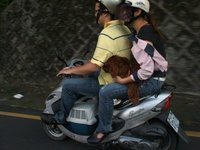 The public transport in Taipei is regular, cheap and pretty reliable but the only real way to explore freely is by having a scooter. 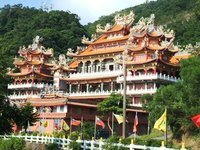 There are a number of places on the outskirts of Taipei that are worth visiting as an escape from the polluted city life of Taipei. 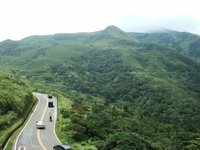 A short ride away from the Shilin district is the road to Yangminshan. 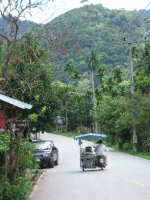 As soon as you reach this area you can smell the sub-tropical vegetation, and even with all the cars, buses and scooters traversing the same curvy mountain roads, the air is much cleaner than in the city. 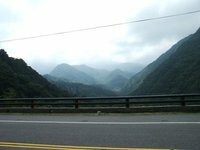 On our first trip we were heading through the mountains towards Jinshan on the north coast of Taiwan. 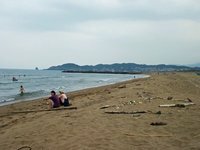 It was our first hunt for a beach in Taiwan and we were looking forward to going swimming. I had heard that many of the beaches had lifeguards who, rather than save lives seemed to take the 'prevention is better than cure' approach by policing a shallow roped off area of the water. 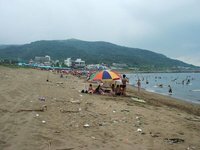 At Jinshan (or Surfer's Beach as it is called) it was possible to swim as far as you like. We were quite disappointed with this beach. It was typically Taiwanese, with sausage stalls at the entrance, smelly toilets with no toilet paper and litter all over the beach. The water was relatively clean but it certainly didn't meet the standard we would have hoped for. The slightly embarassing thing was being surrounded by 'surfers', or at least people looking the part on surfboards, but without a ripple on the water! Our next excursion on the scooter was a few weeks later, this time to Wulai, an aboriginal village in the South of Taipei County. 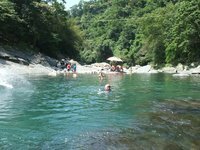 The weather was amazing and we spent the whole day swimming in the river there. 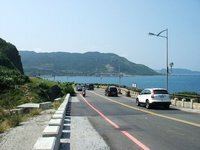 The area we visited is only 5 minutes walk from the main village, which makes it possible to get there by MRT and bus from Taipei City. 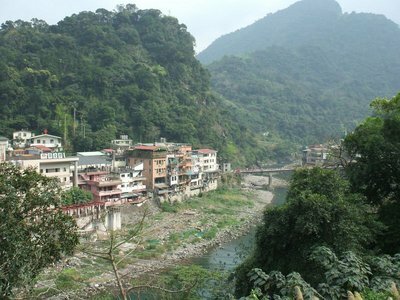 The scenery on the way to Wulai is lovely and you pass by a number of riverside villages. 7-11s are conveniently on the roadside at each village on the way and in the main tourist village you can eat at local restaurants or buy aboriginal souvenirs at the local shops. In true explorer fashion, we set off on the scooter a few weeks later to find Jiufen, an historic village in the mountains north of Taipei. I had visited the village last year on the bus but unfortunately chose the wrong mountain this time round. 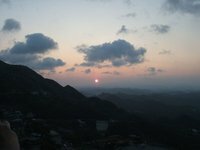 We ended up driving through Yangminshan, round the north coast, through Keelung and finally up a different mountain to Jiufen. The journey was 3 hours there and 45 minutes back home (the correct route!). The bus ride to Jiufen was a little over an hour if I remember right and left from a bus stop by one of the subway exits at Zhongxiao Fuxing. 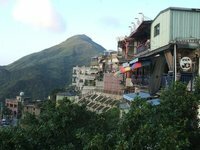 Across from Jiufen village is Mt Jilong (shown above). It is apparently about a 30 minute hike to the top. We were a little tired from the journey to do the hike that day but we're planning to go back soon. Jiufen is a tourist village, which means there are lots of little souvenir, clothes and food shops as well as a number of tea houses with amazing views to the sea. On a clear day the view from Jiufen is beautiful. 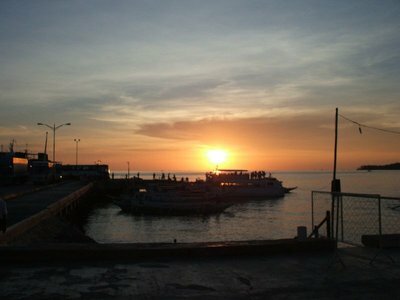 There are viewing platforms where you can watch the sunset, and take photos unobstructed by buildings. 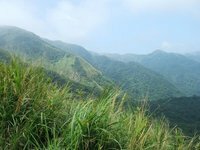 After a beautiful spell of weekend weather we hit the heart of typhoon season and were rained in for a few weeks but now the weather is cooler we're looking forward to doing some hiking in the mountains surrounding Taipei City where we live. View The Big Trip & Weekend in Hong Kong & Taiwan on lucid's travel map. 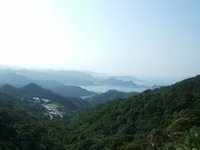 When I moved to Taipei I was told that if I was feeling home sick I should visit Hong Kong. 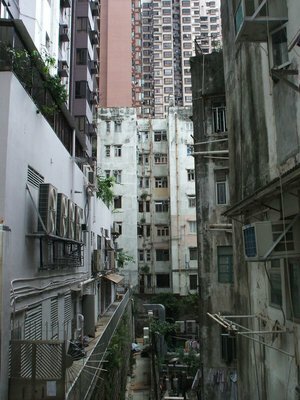 At the time I thought this was strange because, although I was aware that Hong Kong had been a British colony I had no idea to what extent it would feel like home. As I climbed onto a double decker bus at the airport, that proceeded to drive on left side of the road along streets with familiar markings and sign colours I felt very warm inside. The geography of Hong Kong is very different to the UK and the buildings are almost impossibly high, but the style and quirkiness of the shops, buildings and transport systems (ie. 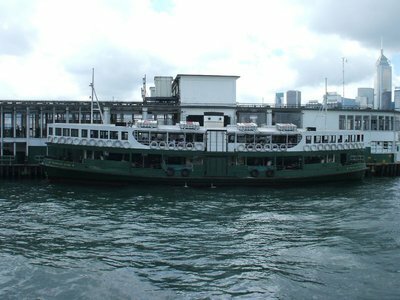 the Star Ferry and trams) reflect the traditional and historical atmosphere of England. Coming from Taipei I was amazed and almost uncomfortable about the amount of foreigners (especially Europeans) walking the streets. Some were clearly residents but lots were tourists from an array of different countries. 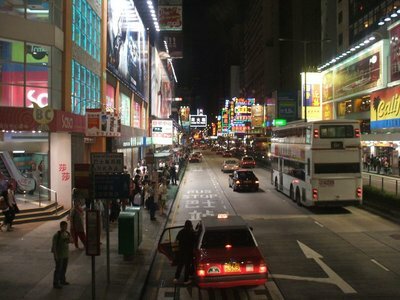 In Kowloon, where I was staying, there were hordes of different groups hanging about in the streets or trying to sell "Copy watch, copy bag" to everyone as they walked past. In central Hong Kong on Sunday there were an incredible amount of Philippino women (most likely nannies) sitting together playing cards in the subways or on the bridges connecting department stores. This was clearly their day off to spend with friends but with little money and no home of their own, they had few places to go. The Hong Kong Chinese are a breath of fresh air after spending so long in Taiwan. Their English is fluent and they show noticeably good manners in public. If they were in my way or caused me to bump into them they always said sorry and were much more aware of themselves and the people around them than the Taiwanese. 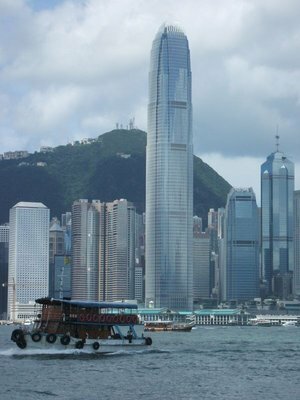 Hong Kong is a great mix of new and old, with beautiful and architecturally amazing buildings, and very traditional aspects like market-style roads and the tram system (both around town and the cable car to the peak). 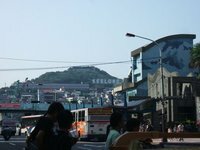 The City is very well developed for tourists and has every kind of restaurant and bar you could want. At night the streets come alive with music and drinking. Small bars open out onto the street and the whole area is full of people. In these areas I would say that about 8/10 people are Westerners. 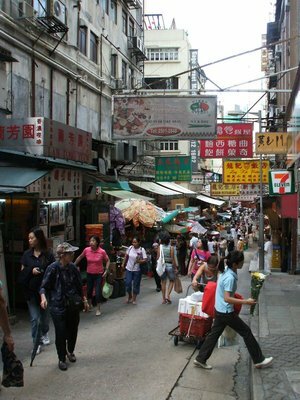 Hong Kong is also good for shopping. I didn't have much money to spend but if I had, I could have bought clothes and shoes in all of the normal sizes from home. There is also an abundance of good food available and not at the inflated prices you would expect. When I worked out the exchange rate, most things were the same equivalent price as in Taiwan but with a much greater range and better quality products. Except for dairy products, which are equally expensive as in Taipei. 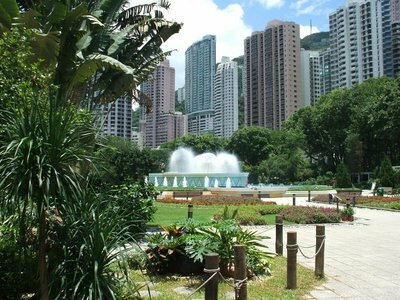 Hong Kong is a beautiful city with a lot to offer and I wish they needed me to teach there! When you first move to a new country you are full of energy to embrace what you encounter and add it to your list of travel experiences. You need a lot of positive energy to turn your initial objective and empirical observations into something you can be part of. In other words, the country can look and smell like crap but at the end of the day it needs to become home, at least for the next year anyway! The emotional experience of moving to a foreign country can initially be one of rejuvenation, but the challenges of life and work can make it a stressful and difficult experience. You miss your friends, family, hobbies, food and who can forget it....a recognisable language! It's a rollercoaster of emotion and inemotion. Sometimes when you should feel sad you feel nothing and other times you can see something like a can of Heinz beans in the supermarket and cry. Homesickness manifests in different ways but you'd be surprised how you project it onto things of seemingly little significance. Homesickness is fleeting but what holds you together or makes you fall apart is the knowledge of why you are living abroad. Some people run away from life or love at home, some look for an opportunity to save money (which usually fails), some want to learn the language of the country and others see it as an opportunity to travel and gain some different experiences. Whatever your motivation for travel, at many points you need to remind yourself of this reason to stop you getting the first flight back home when you're sick to death of everything the country has to offer. I usually get these feelings when I'm stuck behind a group of people who seem scared to walk onto an escalator in the Metro or when I ask for a McFlurry in McDonalds and end up with corn soup! These little annoyances chip away at you until you decide you need a holiday or make a change to your life routine. So that's the early days of living abroad...but your tolerance of the difficulties cannot be measured in time, rather it's a conscious adjustment to your frame of mind. Going back to England for two weeks after my first year in Taiwan was eye opening. I walked around London amazed by the beautiful architecture and the feeling of history. I had previously hated London but suddenly became proud that it was the capital city of my country. By living abroad in a much less appealing place I was able to put my thoughts into perspective. Returning to Taiwan for a second year was difficult but this time I came with a new purpose...saving money. It was the best place to do it and I no longer had to be here so my attitude changed. Things that used to annoy me were everywhere but I told myself it was pointless getting worked up about something I could never change and I should be grateful that I only need endure it for a limited time. The greatest challenge of a year of saving money in a foreign country, is knowing that anything you do before the date of departure is detrimental to your cause. When invited for a weekend away, you calculate the immediate cost and weigh it against the price of the items you need to buy for travelling next year, or the country you might have to miss out of your travel itinerary. It's worse if you are giving yourself a tight living budget because at pay day each month you work out if you overspent and always try to recover the money by eating something local, cheap and crap as a kind of conscience cleansing. If you've somehow managed to save more than you planned in a month it's a very exciting and rewarding feeling, but it only lasts as long as it takes for you to spend the excess (+more!) on something from your travel list. So with all this talk about difficulties and challenges it would seem that contentment would be impossible. However, when you start to see the savings accumulating, each work week passing quickly and relatively hassle free, and you realise that you can afford the odd nice meal or trip away without it draining too much of your finances, it is possible to feel content. I find my countdown timers very heartening and with less than 8 months to go, I'd have to say that time flies not only when you're having fun! View The Big Trip & Boracay & Taiwan on lucid's travel map. I had only been living in Taiwan for 4 months when I booked my holiday to the Philippines. My job was driving me mad and I was desperate for some sun, sea, sand and opportunities to meet new people. It took about 12 hours to get from my apartment in Taipei to my hotel in Boracay. It was only 3 hours flying time but a number of different connections and waiting times made it a pretty long journey. From Kalibo airport I travelled for about 2 hours by bus through narrow roads lined with palm trees and small hut-like houses. 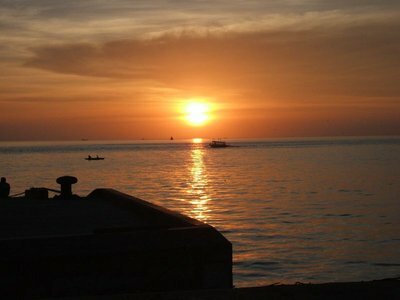 When I reached the harbour to catch the ferry to Boracay I was met with the first of many amazing sunsets. People were looking at me a little strangely on the boat because I was obviously travelling alone, but I felt really relaxed about the whole thing. I was looking forward to meeting some people on the island, having some new conversations and hopefully making some friends I could stay in touch with. It was dark by the time I reached the hotel and I didn't venture far that night. I found the internet cafe, looked at some jewelry stalls and booked myself on a boat trip for the following morning. I woke up early on the first day, had some breakfast and went out for my boat trip. I met two really cool people and the boat trip was great. We went to some caves to snorkle, stopped off at a few random spots in the middle of the sea and bought ice creams from local guys in little boats, who sailed round all the tourist spots with a big cooler box. I met lots of people in Boracay, from lots of different places. It made travelling alone seem very easy because I always had someone to spend time with in the daytimes and evenings. 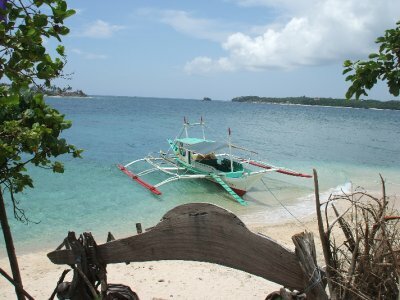 Boracay is a great place for beach bars with live music and a variety of reasonably priced food. 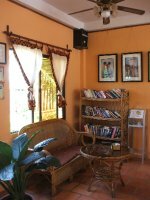 The hotels are nice and many are very cheap (600 pesos per night). I had only booked two night's accomodation when I arrived but I managed to get a 20% loyalty discount at my original hotel and moved to a fanned room to save more money. 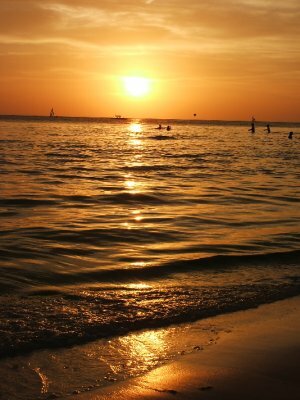 I had a fantastic time in Boracay and I would recommend it to anyone who is travelling in Asia or looking for a holiday on a beautiful island. My first impression of Taiwan was that it smelled of sewage, pollution and stinky tofu stalls. I still smell the tofu and sewage but my nose has become used to the pollution. Having never lived in a city my lungs have been relatively healthy throughout my life. However, I have been unwell countless times in one year here and had Bronchitis twice within 7 months! 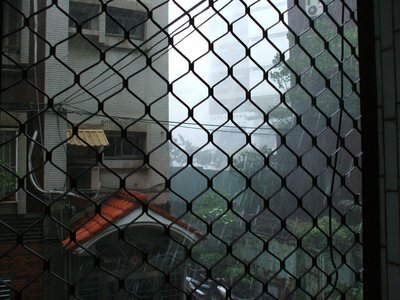 So it's fair to say that the environment in Taipei is not a healthy one. The things you can do in Taiwan are limited by the things you can find out how to do. The level of English is not particularly good for a city (hence the need for English Teachers!). 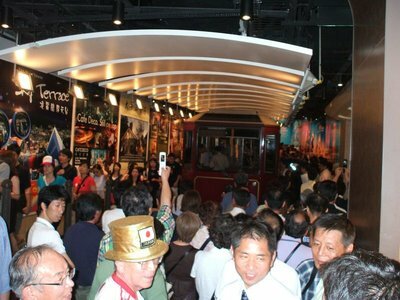 The MRT provides English maps and details of the tourist attractions you can get to by metro. 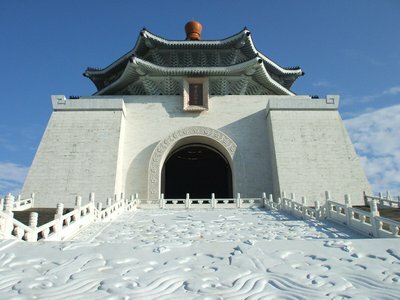 The most 'oriental' tourist spots are Chiang Kai Shek Memorial Hall, The Grand Hotel, Sun Yat Sen Memorial Hall and Longshan Temple. 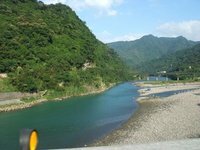 In my first 6 months I went to most of the places on the outskirts of Taipei worth visiting. 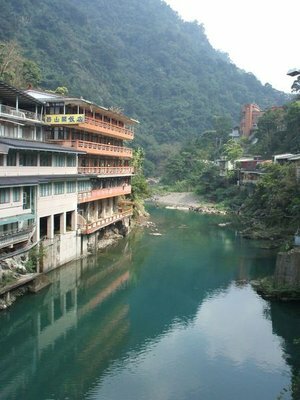 Wulai is an Aboriginal village with pretty mountains and a waterfall. Some of the challenges of living abroad continue on for the whole time you are there. 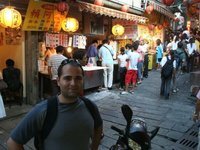 In Taiwan I struggle with the language, the food and the culture. I have tried to embrace these things but I find the food of very low quality and bland taste and the people are pretty much scared of life, which makes them hard to live and work with. Challenges I have overcome are homesickness (although I have a boyfriend now so that helps), and fear of getting lost - I walked across the city for 3 hours and gained a much better knowledge of its geography. 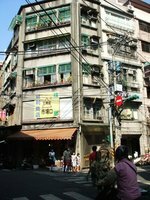 Taiwanese culture is based upon a close family unit - everyone lives together and the young look after the old. Even the families that move abroad expect their children to return to Taiwan to look after them in retirement. The people are concerned about how they look to such an extent that many will lie to avoid admitting they don't know something. Confrontation is not part of society so when people act stupidly, wrongly or dangerously no-one will point it out. I have nearly been run down by taxis who have seen me crossing the street but carry on regardless. They don't care because no-one will do anything about it! 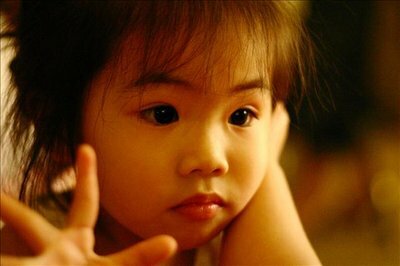 Taiwanese children have virtually no free time because they go to school, English classes, Maths classes, art classes, after-school classes and homework classes! The obsession with education leads to academically educated adults that have no common sense and a very narrow understanding of life outside of Taiwan. One of the guys I met asked me, "Why don't you sound like my BBC CD?" Now I'm not so narrow minded as to group everyone in Taiwan together as ignorant but even my Taiwanese friends fall prey to the same cultural flaws. They are taught to repeat the actions of those before and not to question anything. Therefore they lack creativity and free ideas, which are things I prize so highly.